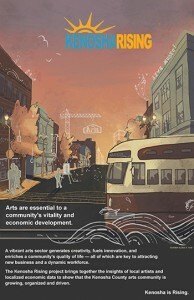 Arts are essential to a community’s vitality and economic development. A vibrant arts sector generates creativity, fuels innovation, and enriches a community’s quality of life — all of which are key to attracting new business and a dynamic workforce. The Kenosha Rising project brings together the insights of local artists and localized economic data to show that the Kenosha County arts community is growing, organized and driven. In August 2015, an online survey was conducted by the City of Kenosha Commission on the Arts, Kenosha County University of Wisconsin-Extension, and Expose Kenosha, with support from the Kenosha Community Foundation, to assess the state of the arts in Kenosha County. A total of 142 local artists participated, sharing their perceptions of the area’s strengths, challenges, and opportunities for continued growth. Then in 2016, a small team of arts advocates worked with researchers from UW-Extension to process the qualitative data presented in the survey results. Those findings including some recommendations for further study found at the link below.